I've covered some of the trends of the recent fashion weeks, but I wanted to stop and take a breather to really appreciate one of the most inspiring of the ready-to-wear Fall/Winter shows. 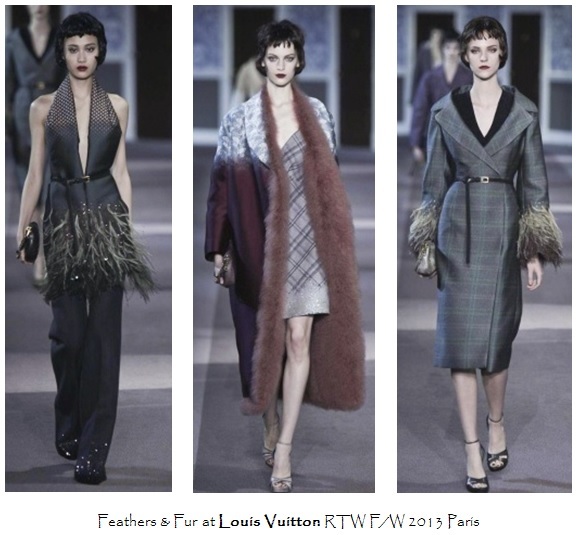 In Paris, Marc Jacobs once again brought the drama to his collection for Louis Vuitton. It's hard to pinpoint exactly why he excels as the head of this fashion house, but his ability to fully realize who "the girl" is (read: the target consumer) for this particular season, is aspirational yet identifiable at the same time. Marc's pieces were not only aesthetically beautiful, but the motivation behind them was thought-provoking. He mentioned that the most fabulous place that a you can get all dressed up to be is your own hotel room or home. Why not lounge around in berry lips and silk pajamas that could just as easily be worn out with an embellished coat and a bit of attitude? In fact, it was these very embellishments that brought a cohesive theme to many of the collection's most stunning pieces. Feathers fused to the edge of menswear-chic jumpsuits and trenches added movement and femininity. On mid-calf coats and dresses, fur placed on the hems and throughout the lining added a lush touch of glam that skewed cool vintage versus gaudy. Marc Jacobs' vision of relaxed elegance continued with the luxe coats over lingerie-inspired underpinnings. The mid-length jackets came in shades of checked taupe and cobalt with ombre sequin details at the hem which really juxtaposed the seemingly contradictory theory of at-home special occasion dressing. 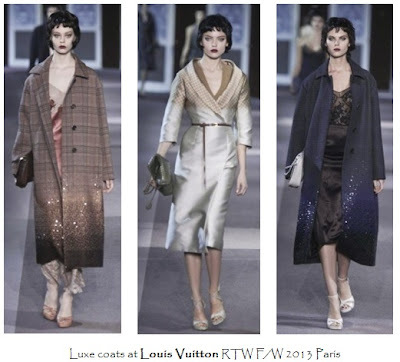 The cowl neckline on his 40's-style shimmering coatdress with fadeway plaid at the top was impeccable. 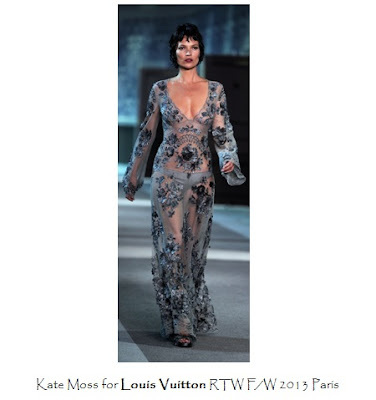 And it wouldn't be a Marc for Louis Vuitton show without his muse, Kate Moss. She stunned in her rare runway turn by confidently flaunting a sheer embellished sky blue gown suitable for a woman who knows she can take the town's most posh events by storm, but would most prefer the most exclusive of them all: her own boudoir. I was very inspired by this collection for Fall/Winter 2013 and will be trying to incorporate elements of retro relaxed-glam into my wardrobe. Did you love the collection as much as I did?